Space Use and Analysis Recommendations: When existing museum space is involved, White Oak starts with a Space Use Analysis and Recommendations, which compares current allocations of space to peers in our databases, to see how retail exhibit, theater, program, administrative and other uses measure up. Outline Architectural Program: A list of every space needed for operating the envisioned plan, organized by function, and stating net square feet, height and level. Architectural Room Book: The Owner’s detailed architectural expectations, functional specifications, programs and adjacencies. Learning Space Matrix integrates museum purposes, audience segments, learning methodology, experience categories and other factors with the museum’s public spaces and their architectural qualities. The matrix allows management to monitor the strategic mix of offerings and it provides direction to architects and exhibit designers. Architectural Search Process: By using our international lists of museum-qualified architects, exhibit designers/fabricators and theater system suppliers, we run selection processes that translate your museum’s objectives into Requests for Proposals (RFP’s) and selection criteria. 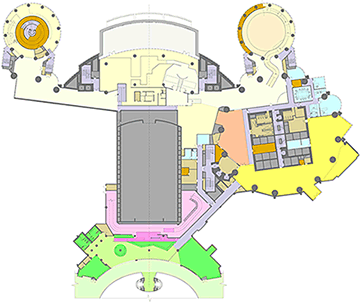 During the design phases, the construction/fabrication process and through opening, White Oak is available for team meetings, site visits and consultations to discuss operational questions and value-engineering choices through more detailed editions of the Room Book and comment memos on the evolving design and construction. 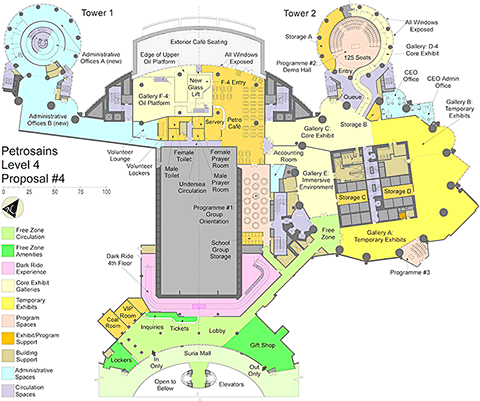 These diagrams for Petrosains in Kuala Lumpur are based on a Space Use Analysis that used extensive plans and CAD programs to size and color-code by function every space in the Discovery Center, located on two floors of the Twin Towers, the landmark designed by Cesar Pelli that opened in 1999. White Oak’s Victor Becker and Jeanie Stahl then compared Petrosains square feet assignments to the space allocation at similar museums, which resulted in specific space use recommendations and new business opportunities. Some of our architectural program development projects include the TELUS Spark! (Calgary, Canada); Petrosains (Kuala Lumpur, Malaysia); DISCOVERY Children’s Museum (Las Vegas, NV); Science Museum of Virginia (Richmond, VA); Rochester Museum & Science Center (Rochester, NY); Peoria Riverfront Museum (Peoria, IL); Canadian Science & Technology Museum (Ottawa, Canada); TELUS World of Science-Edmonton (Edmonton, Canada); Muzeo (Anaheim, CA); Science Center of Iowa (Des Moines, IA); Exploration Place (Wichita, KS) and THE WORKS at the Carnegie Science Center (Pittsburgh, PA).